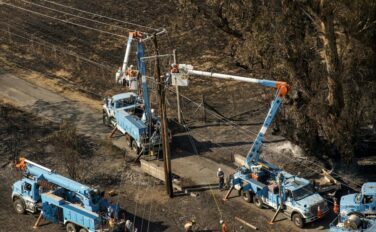 PG&E on Wednesday blasted a federal judge’s plan for wildfire safety as unrealistic, saying his proposal for the utility to inspect every inch of its electrical grid and remove dangerous trees would cost $75 billion to $150 billion and lead to staggering rate hikes. The embattled utility, which plans to file for bankruptcy because of wildfire claims, said it “does not have the ability to raise those funds” and would have to turn to ratepayers for more money. At the low end, a $75 billion increase in costs would generate a rate hike “of more than five times current rates in typical utility bills,” the company said in a filing in U.S. District Court. The company has already asked state regulators for a $1 billion rate increase, in part to fund a more modest safety effort that it says is better suited for reducing California’s considerable wildfire risks than the judge’s plan. “The proposal is not feasible,” the company said of the judge’s plan, adding that it would be impossible to recruit the huge army of tree trimmers needed to comply with the order before the June fire season begins.